Why spend $1 for 65¢ worth of material? You pay No state sales tax, you pay No US Import duties of 31%, and you receive a Currency Exchange Credit... which all together, saves you thousands of dollars!" All our homes use "panelized," pre-built wall panels, stairs and a pre-cut roofing system which cuts building time and saves thousands in labor and building costs. The best lumber comes from Canada, at the best price. 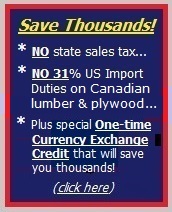 But big local lumber yards like "Lowes" and "Home Depot" pay 31% more to import Canadian lumber. The result: This costs you thousands more for lumber, labor and higher building costs! Reprint Courtesy, "The Washington Post"
As US lumber prices continue to rise, US companies offering building materials packages from Canada can save consumers thousands of dollars when it's time to build. Under "NAFTA," the North American Free Trade Agreement, US companies with mills and suppliers in Canada can ship top-quality lumber, plywood and other building materials at prices up to 38% less than the prices charged by your local lumber store or building center. Here's why: To protect the large US lumber producers, the US government charges 31% in duties and import fees on all Canadian lumber, plywood and building materials. But for US companies operating under NAFTA, there are no tariffs and no import fees. And no state sales tax. Canada has long been recognized for high quality lumber and plywood... the main building components in every home. With interest rates near record lows, saving thousands in building costs can be another incentive for customers to build the home or vacation cabin they always wanted. Our Cabin Kit packages are complete "panelized," weather-tight structural shell packages" from our own Canadian forests and mills. Everything you or your builder needs is included... from the top of the foundation to the top of the roof! We are always happy to answer your questions. Please feel free to call us toll free: 1-888-358-1113.